Last week we wrote about PETA’s new video game where you take the role of a famous Mixed Martial Arts (MMA) fighter and travel around university and pharmaceutical labs assaulting scientists. posted at brief intervals over the past ten days. One could be forgiven for thinking PETA had hired Mr Hyde to run their twitter feed. @peta I really find this inappropriate...how do you feel about games where the goal is to "knock out" animals? The principle is the same. It’s a good question. How do PETA react when video games depict violence against animals? Peta have attacked a string of video games for apparent cruelty to animals including Battlefield 3, where one mission allows you to kill errant mice, and World of Warcraft where you can attack seals. However both games are very clearly intending to depict fictional events (sorry kids, real wizards are just chemistry professors in pointy hats). PETA might have a point if Super Mario 3 had been developed by the raccoon-dog fur industry to promote racoon-dog-fur-wearing among the public, but instead it’s a cute gimmick by Nintendo to give Mario the power to fly. So PETA attack video games which depict violence against animals, and develop video games promoting violence against humans. But wait, Dr Jekyll is back! @tomholder It a fun game, a fantasy for animals trying to flee torture. We aren't actually promoting violence. It is worth noting that freeing animals is an optional part of the game whereas beating up all the scientists is necessary to complete it. Do we think the PETA staff would be as permissive of the game “Ethnic Cleansing“, where the object is to kill Jews and African-Americans? Would a disclaimer at the start, or arguing that “It is a fun game, a fantasy for white supermacists. We aren’t actually promoting violence” make it any more acceptable? Nonetheless, PETA seem determined that their game does not promote violence. Does PETA advocate the use of violence? PETA maintains a creed of nonviolence and does not advocate actions in which anyone, human or nonhuman, is injured. We are a legal activist organization that works to educate the public about the horrors of animal cruelty through peaceful, nonviolent means. No one has ever been killed through animal rights activity in the United States. Well PETA’s creed also says that does not advocate actions in which humans are injured, which seems to sit awkwardly with tweets asking followers if they want to take on the opportunity to beat up scientists. It is also worth noting that while the animal rights movement may not have killed anyone in the US, it has torched their cars, flooded their houses and threatened their children. @peta If I said "Ever feel like punching an abortion doctor / climate scientist / teacher, play our game", would that also be acceptable? @tomholder Those other scientists you mentioned do not living beings who are capable of feeling pain and suffering. Bad comparison. I presume that Dr Jekyll is missing the word “harm” (or similar). At first you could be forgiven for thinking PETA have a point (although many schoolchildren may disagree after a Double Maths lesson, and the Pro-Life movement would also disagree). However, on second reading you realise that PETA are saying that it’s not acceptable to make a video game where you punch teachers/doctors, but it is acceptable to make a video game punching scientists, but why is this the case ? Could it be that a game attacking teachers/doctors would promote violence against those groups. We’ll let you decide. PETA exhibit a level of doublethink which would impress even Jekyll and Hyde (the real ones, not the PETA staff tweeters). Perhaps they should work out a clear moral code before embarking on their next video game. Keep an eye on the @Speakingofresearch and @Tomholder Twitter to see how this debate develops. P.s. 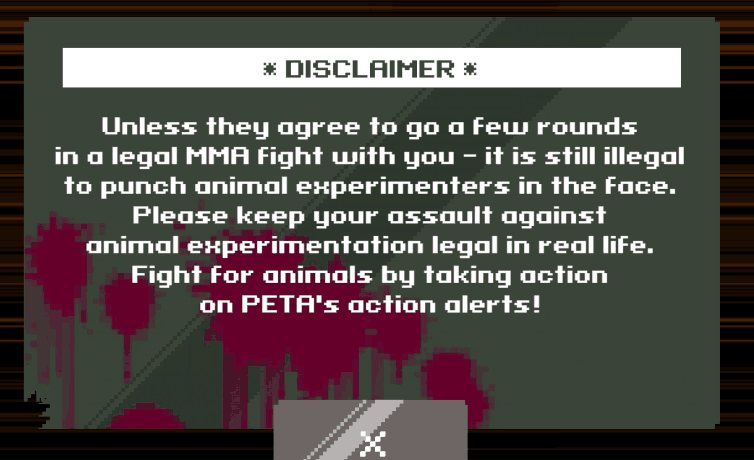 make sure you read our original post about PETA’s MMA game. Posted on June 18, 2013 June 19, 2013 by EditorPosted in Animal Rights News, NewsTagged beat up scientists, justifying violence, MMA, peta, twitter. Next Next post: Time for a change? Stopping animal research would be harmful to humans and animals alike. That alone would kill many people and animals alike. Yes, that’s violence. Ever wish you could punch an animal rights activist in the face? Here’s your chance…. Now, here’s a challenge for the PETA fanboys; can any of you name a lab that kills more animals than PETA? i honestly think you guys should lay off. peta is amazing! PETA is all about PETA. They aren’t really concerned with animals as much as they are about publicity that makes it LOOK like they care about animals. If they truly cared about the suffering of animals, they would spend some of that vast amount of money they have on helping local shelters and animal rescue groups. They do not. Don’t forget peta’s stupid “Holocaust on your plate” nonsense: being forced to apologize for such unimaginable stupidity would be bad enough, but responding with the most unconvincing apology imaginable when forced to apologize is even less sane! I heard that they drill holes in chimps skulls with blunt teaspoons to extract brain matter that they smear on toast, which is then left next to a cup of hot tea. It’s REAL science!!1! These evil scientists should be kicked to death with there own amputated limbs. You can practice on the simulator. Haha i love how im suppose to feel bad for people who lock chimps up in cages and drill holes in their brains,then go out to lunch with their co-workers ,haha you guys are pathetic.Peta you rock. Ha ha ha… you replied as if the original poster, Lisa, had an original thought or even cared about reality.